2. In a roasting pan, over medium high heat, preheat oil. 3. Coat pot roast with flour and season with salt and pepper. 4. 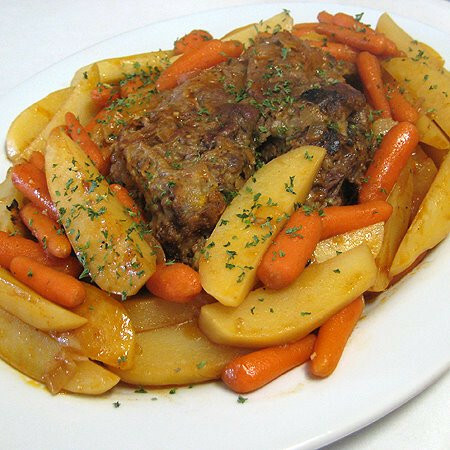 Brown pot roast on all sides. 5. Add garlic and onions to pan when pot roast is almost finished; stirring vegetables to keep them from browning. 6. Pour in beef stock, V8 Original juice, brown sugar, Worcestershire sauce, and vinegar. 7. Cover tightly with foil and bake for two hours, uncover and add potatoes and carrots and bake for a further hour. This delicious and exciting family dinner recipe was brought to you by Lauren Powell from realmomkitchen.com. She’s an increadible cook, and this scrumptious dish is proof of that.